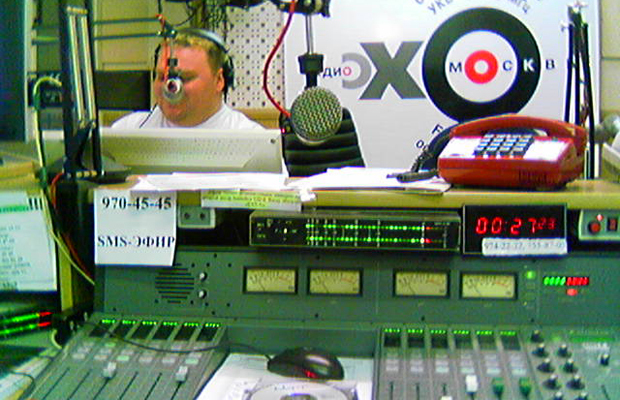 Ekho Moskvy (Echo Moscow) is an independent Russian radio station. One of few media outlets that is critical of Vladimir Putin’s regime, it is revered by many as the last bastion of free speech in the country. Ekho was set up in 1990 by radio veterans jaded with Soviet propaganda, and has taken an interrogative stance towards Russia’s government ever since. Its focus is on maintaining balance – it airs pro and anti-Kremlin voices in equal measure. Its editor-in-chief, Alexei Venediktov, has often done battle with Putin and his government. In 2012 Putin is said to have remarked that Ekho served foreign interests, and “pour[ed] diarrhoea over me day and night”. During the 1990s, Russia’s news outlets developed into a world-respected critical force. But since Putin came into power in 1999, the media’s role as objective watchdog has diminished, and most news organisations are now resolutely pro-Kremlin. In 2014, Russia attracted significant international condemnation over its involvement with the Ukraine civil war. In response, Putin began to cultivate an us-versus-them atmosphere in his country which saw his popular approval ratings grow to 80 per cent. Such an atmosphere has little room for dissidence, and anti-government voices have been silenced. The remaining politically independent news outlets are gradually being banned, crippled or brought in line with the Kremlin. Last year was especially turbulent for Ekho Moskvy, which fought Putin’s media crackdown on many fronts. Its website was banned in March by Roskomnadzor, Russia’s media watchdog, after it published a blog post by leading opposition figure Alexei Navalny. In December, the Dagestan limb of the station was shut down by Roskomnadzor for no official reason. The outlet was issued its own warning from Roskomnadzor in October. The watchdog cited two interviews aired by Ekho with journalists who provided first-hand accounts of fighting in eastern Ukraine. Roskomnadzor said the programme contained “information justifying war crimes,” and ordered the station to take down the interview transcripts from its website. Two cautions from Roskomnadzor in a year usually leads to an organisation’s closure. Alexander Plyushchev, who conducted the banned interviews, was fired by Ekho’s owner Gazprom-Media in November, though Venediktov would later reject the dismissal and reinstate Plyushchev. Ostensibly, Plyushchev was sacked because of an insensitive tweet he had sent about the death of the son of Putin’s chief of staff. But Venediktov has suggested that Plyushchev’s controversial interviews the month before are behind the firing by Gazprom-Media owner Mikhail Lesin, Putin’s former press minister. Despite challenges, the station’s news coverage was commended for staying true to its spirit of independence. Reports on the fighting between pro-Russian separatists and the Ukraine government were praised for their even-handedness, at a time when the majority of Russian media took a staunchly pro-Kremlin approach. As a result, Venediktov and his colleagues have appeared on several blacklists and have been labelled “enemies of Russia”.